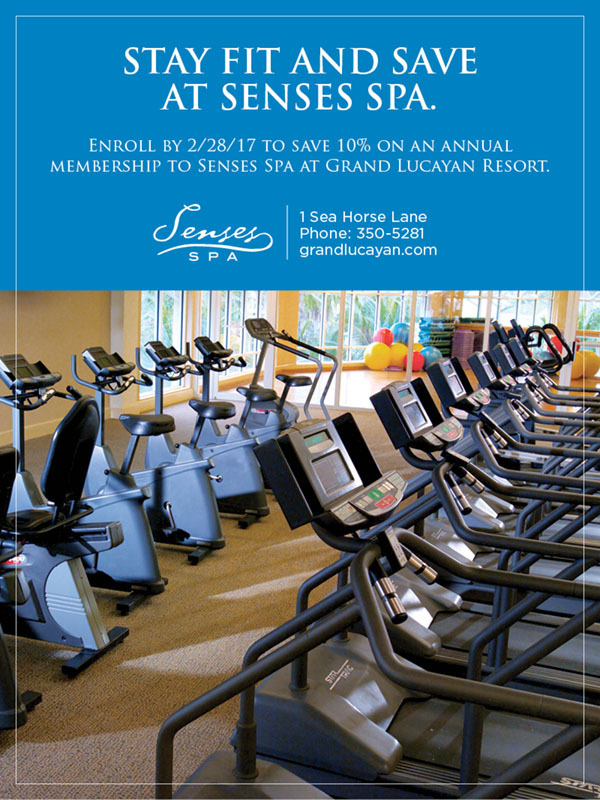 Freeport, Grand Bahama Island it's time to Give Your Workout a Tropical Twist at Senses Spa. From spinning to step aerobics, Grand Lucayan offers a wide variety of group instruction and fitness classes to keep your workout routine fresh and fun. Star Trac treadmills, bicycles and steppers team up with Flex weight training equipment to keep your fitness routine fresh and focused. Whether you’re a beginner or longtime yoga enthusiast, we think you’ll agree that nothing beats striking a pose against our beachfront backdrop. Our certified instructors offer group instruction in spinning, step aerobics, Tae Bo, Pilates and kickboxing. Prefer a one-on-one workout? Our team of certified personal trainers will work with you to achieve your fitness goals. Whether you want to ramp up your cardio capabilities or begin a strength training program, we're here with expertise and encouragement. Located on Grand Bahama Island, Grand Lucayan, Bahamas has 738 guestrooms and suites and is situated along an expansive 7.5-acre beach with views of the turquoise Caribbean Sea. Just 55 miles off the coast of Florida, Grand Lucayan, Bahamas offers some of the finest amenities in the Caribbean. Guests enjoy spacious accommodations, a selection of restaurants, swimming pools, four tennis courts – all offering Grand Slam surfaces, a 25,000 square-foot Senses Spa & Fitness Center, 18-hole championship golf course – The Reef Course, designed by Robert Trent Jones Jr., and 90,000 square feet of indoor and outdoor meeting space and a Las Vegas-style casino. Like us on Facebook, facebook.com/grandlucayan or follow us on Twitter, @grandlucayan.